So, I’ve had a chance to watch pilots for a couple of new shows lately, like recently when I watched and reviewed CW’s The Flash. The other night I got the opportunity to see the Pilot of NBC’s upcoming show, “Constantine”. For a pilot it was pretty good, but it had it’s issues that I hope to see ironed out over the course of the series. If I was forced to compare how I felt watching Constantine to another viewing experience, I’d be forced to compare it to FOX’s Sleepy Hollow. It’s a concept and idea that seems to hold a lot of promise, but it feels sloppily executed and hastily thrown together. While watching the pilot I kept getting the feeling that they were told to stuff 2 hours of content into a 45 minute sack. OR that they expected all of their viewers to have an IQ below 70 so everything needs spoon-fed. Even our introduction to the character is ham-fisted, at best. We’re introduced to our hero during his psych evaluation and in the course of 5 minutes, we’re told who he is, where he’s from, what the dark part of his past is and they even make sure to bring up his business card that says “John Constantine, Exorcist, Demonologist, and Master of the Dark Arts.” It’s like I’m eating at a Denny’s and the waitress just walked by, slammed my Grand Slam on the table and went “Here’s your freakin’ food.” The show has all the writing subtlety of a Justin Bieber song. He even exorcises a demon within the first 15 minutes of the show. Just in case you thought he was John Constantine, Flower Arranger. Speaking of our hero, I honestly feel that Keanu Reeves was a far superior Constantine. This gentleman may have the accent and the blonde hair, but a rat in a dress is still a rat. Constantine and Chaz, in this show, both seem to have the emotional depth of a puddle. Whether Constantine is talking about facing down an electric demon or making breakfast, it’s all delivered in a dry, monotone that left me wishing I had Keanu’s occasional Shatner-Acting to punch it up. Visually, he wears a trench coat that I assume he’s owned for years and had through all his exorcisms and demon dealings, but it looks so crisp and clean that it makes me assume he’s stopping to press and clean his coat between every scene. Crisp, Clean and ready to fight demons. 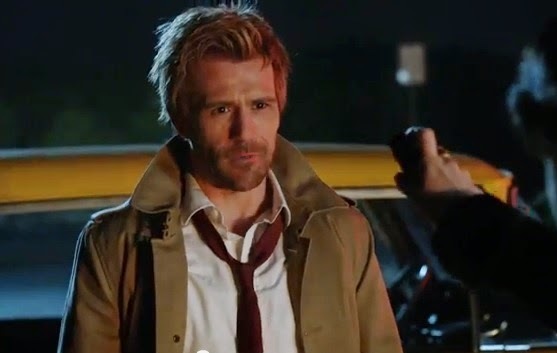 This Magical Coat doesn’t even get dirty or singed when Constantine climbs into a ditch or walks in fire. The amount of stuff that the show throws at you in just the pilot episode are things that could have easily been spread across a season, allowing the show to focus more on the characters. Instead of feeling like it has well fleshed out characters, everyone is a cookie cutter feeling character with little to no depth. I feel like I’m getting ready to watch a hastily thrown together procedural show, not something that has nearly 30 years of mythology to build itself on (if you count his first appearance in Swamp Thing #37 in 1985 as the genesis of the character). Now I understand that this is just a pilot, meant to get a network to pick up a show and may not even be the episode that actually airs. For instance “Serenity” was the Pilot for “Firefly”, but “Train Job” was the first episode aired. So, I understand that what hits the TV might be drastically different, but as of now NBC has in no way impressed me and it’s the first of the recent DC Universe shows to disappoint. All that being said, I was tickled when I saw Doctor Fate’s helmet.